Have you ever seen fish climb a ladder? Well, you can, in Thornbury. Every fall, migrating salmon make their way up stream to spawn, using the man-made fish ladder to help them on their way. The Fish Ladder is a busy spot during this time, as locals and visitors line up on the bridge to watch the huge fish jump up the ladder to get to their spawning grounds, where they lay their eggs. After the eggs hatch, the young salmon return to the area the following spring. 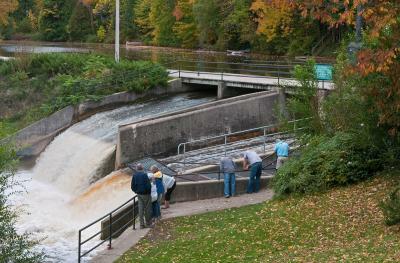 The Fish Ladder is located in the heart of Thornbury, within steps of the downtown core. Make a day of it and you’ll have lots of fish stories to tell your friends!